System 2, on the other hand, is slow to engage, deliberate, and lazy. It deals with doubt, uncertainty, statistics, and heavy cognitive loads like writing, performing surgery, solving advanced math—anything that requires intense focus, really. System 2 is not emotional. It’s the part of your brain that questions the source, asks for hard numbers to back up claims, and is innately critical. It deems things guilty until proven innocent. While system 1 gets us through the day, system 2 is the better thinker and problem solver. It’s even energy efficient. Since it drains our mental battery so fast, it’s reluctant to kick in unless we ask it to. The reason: If our mental battery hits empty before sleeping time (aka recharging), system 1 is susceptible to basic survival and operational mistakes. Which explains why a good night’s sleep is so critical. When we understand these dual thinking types, we can train ourselves to become more thoughtful, less biased, more rational, and ultimately commit fewer mistakes, Kahneman argues. When we distinguish the two, we slow down important decisions to trigger system 2 more. When we do that, we broaden our perspective, we gather data, we avoid buyer’s remorse, we consider comparative choices instead of immediate, narrow-minded, or knee-jerk ones. When system 2 is engaged, we make logical, more rational decisions. We reflect upon those decisions, check them for accuracy, and learn from them. Again, because it’s so difficult to engage system 2 thinking in the the moment, Kahneman recommends adopting little policies to broaden your perspective. Like a policy to “never” buy an extended warranty, never attend a sales presentation disguised as a social “party” (I’m looking at you ladies), and running far, far, away when someone advises you to “get in on the ground floor” or any other sales tricks, fine print, and incongruent marketing you encounter. 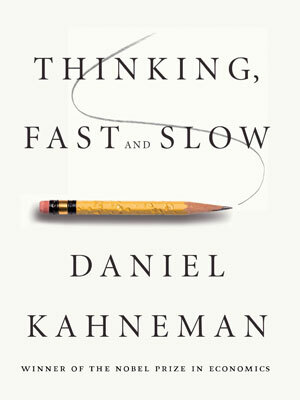 In addition to dishing on system 1 versus system 2 thinking, Kahneman disproves utility theory, validates sunk cost fallacy, and explains prospect theory and the endowment effect. He also shows how priming, overestimated risk, and cognitive illusion all trick system 1 into making poor decisions that system 2 can usually stop. Not only that, he explains how the “possibility vs certainty effect” affects bad risks, and why money can only buy you happiness up to $75,000 a year. (E.g. wealth reduces the impact of life’s simple pleasures and $75k is enough to buy modern comforts and experiences before diminishing returns hit). In addition to teaching readers how to engage system 2 more often, it’ll make you a better critic of life’s experiences and maybe even help you find peace in the past. As Kahneman found, happiness is determined by both our experiencing and remembering selves. The experiencing self sits through the entire movie, the whole journey, all of life. The remembering self is merely a highlight reel tasked with telling the condensed story. But our memory is not an ideal resource to consult for decisions about future experiences since our remembering self only focuses on emotional peaks and valleys without taking into consideration the entire duration or experience. So even though “the remembering self, not the experiencing self, is who we are,” we can use system 2 thinking to recall our experiencing self and avoid “duration neglect.” We can also use what Kahneman calls the “U-index” to factor duration of misery or boredom while improving our overall happiness, rather than being blinded by temporary emotional highs. In other words, knowing our U-index can help us avoid long commutes and passive pleasures like TV, while helping us increase the time we spend with people, exercise, and rewarding experiences. You know, the things in life that bring true happiness. All told, I haven’t been this excited by a book in years. You owe it to yourself to at least read the synopsis. Kahneman’s theories and sound evidence on the brain are not only legit, they’re life-changing.